Although HF has multiple causes amongst which coronary artery disease, hypertension and non-ischemic dilated cardiomyopathy are the most common, it results in the same final common pathway of neurohormonal activation and multiorgan dysfunction in the context of a salt-avid state. Contemporary pharmacologic HF therapy targets neurohormonal activation at multiple levels with - blockers, angiotensin converting enzyme inhibitors, and aldosterone inhibitors, aiming in reversing both its systemic consequences, and the adverse heart remodeling, however is frequently hampered by side effects of the drugs, limiting its benefit. During the last 40 years studies of the gross and molecular aspects of the pathophysiology of HF convincingly converge to the conclusion that deranged calcium (Ca2+) handling in the cardiomyocytes plays a cardinal role in HF initiation and progression. The delicate and precise regulation of Ca2+ cycling i.e. movement into and out of the cell, as well as into and out of the sarcoplasmic reticulum (SR), is finely tuned by numerous macromolecular proteins and regulatory processes like phosphorylation and dephosphorylation, and is severely deranged in HF. 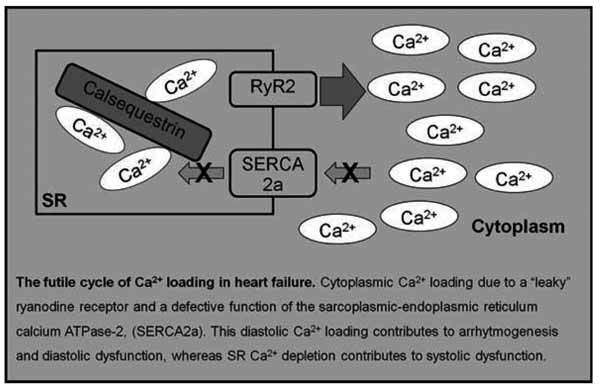 The common denominator in this scenario is Ca2+ depletion of the SR, however loading of cardiomyocytes with Ca2+ as a result of classic inotropic therapy has proved to be detrimental in the long term. Therefore, the mediator and/or regulatory components of the Ca2+ cycling apparatus have been the focus of extensive research involving targeted pharmacologic and gene interventions aiming to a restoration of Ca2+ cycling processes, thus improving inotropy and lucitropy in a more “physiologic” way in the failing myocardium. Hear failure, calcium, homeostasis, kinetics. Cardiology Department, Patras University Hospital, Rion 26504, Greece.